Real-time 3D recording had eluded us – until Aaron Koblin, Scott Hessels, and Gabriel Dunne (a group of researchers at UCLA), inspired James Frost to direct the world’s first music video shot entirely without cameras. Instead he used a LIDAR Laser and a geometric texture-mapping laser (for facial closeups). His inspiration came from a project called “Celestial Movements”. With this project the aforementioned researchers used lasers to record the movement of manmade aerial vehicles in the night sky. They then compiled data sets into one image, or animated still images to create stunning visual representations of the data. But, rather than being strictly creative, this project “combines science, statistical display, and contemporary art”. 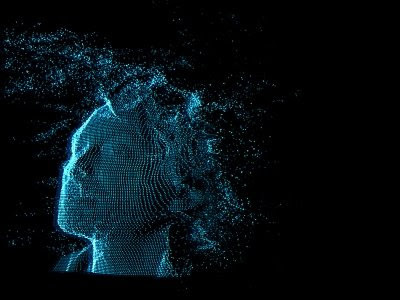 The first purely creative endeavor using 3D laser imaging is this new effort from Radiohead, the video for “House of Cards“. Known as innovators, Radiohead was the obvious choice for real actualization, especially because James was in tight with their manager. Realizing this piece required two rented lasers, teams of technicians, and scores of quad cores. Luckily, the moneymen trusted James’ vision. It reminds me of the old Amiga Video Toast effects from early nineties videos. The similarity isn’t the look of the laser’s effect, but rather this video, like toast effects, is the earliest implementation of an exciting new tool for video artists. Still in it’s infancy, it holds so much promise to inspire innovation. Think you can do better with your own 3D rendering software? Download the original CSV files and prove it. Or just get a snippet to play with till you get board of it. ~ by Andrew Harris on July 17, 2008.
i.e. that Thom wanted to make the entire world disassemble itself -any thoughts on the lyrics? I think House of cards speaks to unsustainable suburban sprawl, and the flawed ideals of consumerism. The disassembling or vaporization seems to represent a desire to start from the beginning to get it right. Maybe. Ohhhhh! This is so freggin’ rad! !